When a violent attack leaves cowman J.T. Tussle in trouble, the Landons and Lee Mattingly are quick to come to his aid. Tussle must get his yearlings to market, and they embark on a cattle drive to Fort Worth. Along the way, they get caught up in herd cutters, a bounty hunter, relationships, thunderstorms, and each other. Tell Cotten has once more come up with a very fast moving story in his Landon Saga series. This time the whole book is written in the third person rather than being part third and first as many of the previous books have been. Due to the fact that all the major characters from the series are in this, and the story switches regularly between them and no one person takes centre stage so to speak, I guess it was easier to make the story flow by sticking to the third person. If you’ve never read one of the Landon books before I’m going to suggest that it might be wise to start from the beginning as this book continues and concludes a number of storylines carried over from the earlier books. Of course Tell Cotten leaves a couple more plot threads hanging for continuation in the next book of the series. Much of the story is dialogue driven and there’s some great and often tense conversations laced with humour. Tell Cotten’s action scenes make for exciting reading and they come thick and fast throughout the story. During all this there is time for developing romance but I can’t say any more about that as I don’t want to spoil anything for those who are following the series and have yet to read this book. Tell Cotten also includes a real historical person, John T, Lytle, into the mix. Top class entertainment from a top class western author. 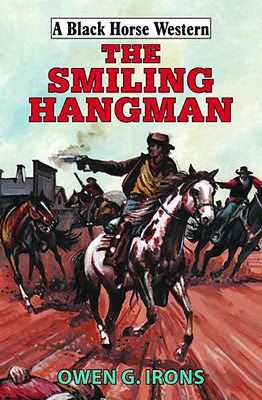 A writer all fans of the western should be reading. Roll on book eight in the series: Warpath, it can’t come soon enough for me. The town of King’s Creek is in uproar. Young Matthew Lydell has been found guilty of murdering the beautiful Janet Teasdale, daughter of a local banker. Lydell, mute throughout his trial, is to be hanged. But the town marshal has been delaying proceedings, and he has sent for a hangman from the county seat. The roughs in town try to rush the jail three times; they won’t wait to exact revenge. When the hangman arrives, he does so quietly and unnoticed. The man in black tours the jail and the town, smiling, always smiling. What secret lies behind that smile and what intentions does he have for the Colt that rides on his hip? Owen G. Irons blends western and mystery superbly in a tale that defies you to put it down before all the story elements are resolved, and, of course, this doesn’t happen till the end. Why doesn’t Lydell defend himself? Janet Teasdale may be dead but why hasn’t her corpse been found? And what of the bank robbery that seems to be the perfect crime? Puzzles that will soon have you wondering as to just what is going on and whether these events are linked in some-way. As more questions arise during a savage gunfight to take Lydell from the jail and lynch him, you have to wonder if anyone will be left alive to provide the answers. Owen G. Irons’ latest story moves forwards at a tremendous pace, mixing frustrations, explosive action and humour – the latter mainly provided by two waitresses methods to fend off unwanted attention. And then there’s Storm Hiller, the smiling hangman of the title. Just who is he and what does he really want? These questions are answered fairly early on but transform into the gripping problems of how he can succeed in his aims. 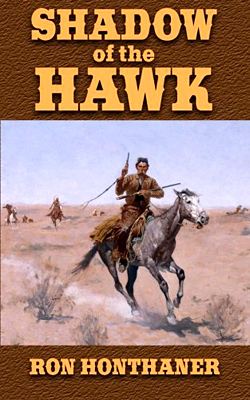 Once more Owen G. Irons (a pseudonym used by Paul Lederer) has written a terrific book that again strengthens my belief that he is one of the best writers producing westerns for the Black Horse Western line today. Mountain-man Mike McCloskey, a run-away slave Thaddeus, and a young orphan Jericho, lives cross paths and they become lifelong friends. As time passes Jericho becomes a sheriff, Thaddeus moves into town, but Mike continues to live and trap with his Indian wife and daughter in the mountains even though the days are numbered for his kind of life. When Mike heads into town to purchase supplies, he defends an Indian friend’s life from outlaw cowboys and sets in motion a collision of mishaps—a single mistake changes his life and the lives of friends and enemies alike. Ron Honthaner is a film and TV veteran whose first script for Gunsmoke landed him a job on the series, going on to write other scripts for the show, then working as post production supervisor and later, associate producer. He was the recipient of two Cowboy Hall of Fame awards for his work on the Gunsmoke producing team. The first half of this fast moving tale includes many flash-back sequences to explain the relationship between the three main characters, although much of the emphasis is on McCloskey’s life working on flat-boats and steamboats. 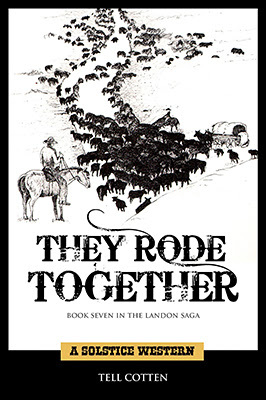 Most of the books other characters have their backstories explained too as a group of very different people find themselves riding in a posse. Once McCloskey becomes the target of the posse after a bloody and vicious rage driven rampage then the emotional side of hunting a friend becomes a major issue of the story and you can never be sure which way the tale will go next when it comes to who will kill who if the opportunity arises and how much the bond of friendship will dictate the state of play. Honthaner’s writing is a pure joy to read and his background in writing for TV is very evident in how easily this story paints visual imagery in the mind-eye. Character development is excellent and the action scenes brutal and graphic. What happens to McCloskey to make him go on a killing spree comes as a complete surprise. After that the story is a straight chase tale that may not end how you think it will. If anymore westerns by Ron Honthaner are published you can be certain I’ll be reading them.